Join us for our 2nd Data+Women Tableau User Group in Dublin where we will be collaborating with Viz for Social Good. The event is intended to support women who work in the field of data and analytics. Everyone is welcome, regardless of gender. If you want to read more about the wider Data+Women Community, there is a nice overview here from Tableau's Jordan Scott. You can also have a listen to the latest webinar from the Data+Women Virtual Tableau User Group. On the night, we look forward to hearing from three Women in Data listed below. We will then participate in a collaborative hands-on session using Tableau. Together we can explore and discuss the data for the latest project featured on the Viz for Social Good website and design some visualisations. Viz for Social Good is an organisation founded by Tableau Zen Master Chloe Tseng. Its goal is to harness the power of data visualisation to support non-profits. I would encourage everyone to read up on the project and review the data in advance. This event is for Tableau users, from beginner level to advanced, who are keen to put their data visualisations skills to good use. 19:30 - 21:00 'Viz for Social Good' hands-on session as outlined above. Please bring a laptop if you wish to participate. You will need to have Tableau installed (a 14-day trial can be downloaded from the Tableau website). I would also recommend you take this opportunity to check out Tableau Prep if you haven't done so already. This blog looks at some of the quick wins. We will be reaching out with more details via e-mail in advance of the event so please watch out for this. Founded and run by Tableau Zen Master Chloe Tseng, Viz for Social Good is a community project that helps mission-driven organisations harness the power of data visualisation for social change. Viz for Social Good has been named a finalist in the Fast Company's 2018 World Changing Ideas Awards and was awarded a Silver at the 2017 Information is Beautiful Awards. Join Neil Richards and Dilyana Suleymaova for a brief introduction to this initiative, then meet and viz with your fellow attendees on the latest project for IOM to empower decision makers to design and implement more targeted and effective strategies to combat human trafficking. All are welcome, whatever your level of experience from absolute beginner to accomplished vizzer, just be sure to bring your laptops! and her feedback on submissions from the Dear Tech People project. 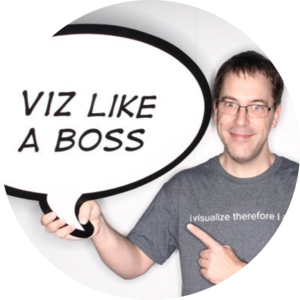 If you'd like to get feedback on your visualization from Giorgia, you should join our project (Dear Tech People)! Nadieh will be reviewing submissions from the UNSCO project, and share her visualization tips and feedback!